We, your hosts Tim and Wandy, want to offer our guests a great place to have their holiday or a short break by providing accommodation in a beautiful house where they can truly relax. We left science and Sydney behind in 2000 to create what we now call the “last oasis in Byron Bay” and love sharing our beautiful surrounds and making your stay in Byron Bay an enjoyable one. We offer our guests plenty of advice on where to go, where to eat, what to see and what is on at the moment. 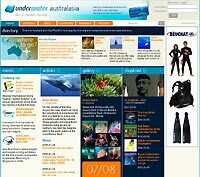 If you have been looking for diving information on the internet, you would have stumbled over a website called underwater.com.au – a project we started in 2002 and a website that has become the most visited diving website in Australasia. 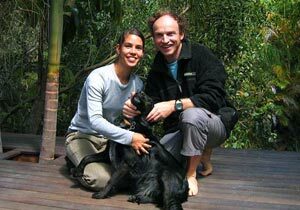 We now have a team of helpers and underwater australasia is going from strength to strength. In 2007 we started another project, the Byron Underwater Festival. An annual event in Byron Bay at the end of Summer that attracts any kind of underwater enthusiast. Artists can compete in the Marine Visions contest, divers and snorkellers compete in photo and video shoot-out competitions for over $20,000 worth of prizes. There are plenty of free presentations, film premieres, other screenings and a whole lot more. Where does our name ‘Planula’ come from? 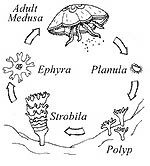 Planula is the name of the larval stage of anemones, jellyfish or coral following sexual reproduction. The diagram shows a general schematic overview of the lifecycles of these animals. Planula – plural PLANULAE, free-swimming or crawling larval type common in many species of the phylum Cnidaria (e.g., jellyfish, corals, and sea anemones). The planula body is more or less cylindrical or egg-shaped and bears numerous cilia (tiny hairlike projections), which are used for locomotion. Planulae are produced by both of the basic body forms found in cnidarians–polyps, the stalklike, attached adult forms, and medusae, the bell-or umbrella-shaped, free-swimming adult forms.